Room H2o has significant experience and skill in designing, supplying and creating disabled bathrooms, disabled shower rooms and washing facilities with easy access and use for people with limited mobility and of advanced years. Offering bath aids for the elderly, level-access walk-in showers and grab rails as well as accessible toilets, basins and bathtubs, the Room H2o team is experienced at listening to the specific needs of each customer and finding the perfect bathroom design solution that will provide everything needed for independent or assisted living now and in the future. We offer a complete design, supply and installation service for disabled bathrooms, disabled shower rooms, disabled wet rooms and accessible cloak rooms. This includes all tiling, plumbing and electrical work for a comprehensive quality job. Walk-in showers – Specialists in all kinds of shower enclosures, including made-to-measure showers to suit specific needs – Room H2o offers the finest walk-in showers for customers who are disabled, of impaired movement or approaching old age (including half-height shower doors and frameless shower enclosures) that are safe and simple to access, use and keep clean. Disabled wet rooms – With level flooring and a shower-tray that sits flush in a fully waterproof and easy-access showering area, a disabled wet room is ideal for anyone looking to provide for those with impaired mobility and future-proof their home. Seamless and space-saving, wet rooms for small bathrooms are often a stylish and functional possibility to make shower-time simple and safe for the whole family even in a limited space. Walk-in baths – Should you or a member of your family have trouble getting in and out of the bath with the assistance of grab rails and other bath aids for the elderly or disabled, one of our walk-in baths could be the perfect solution. 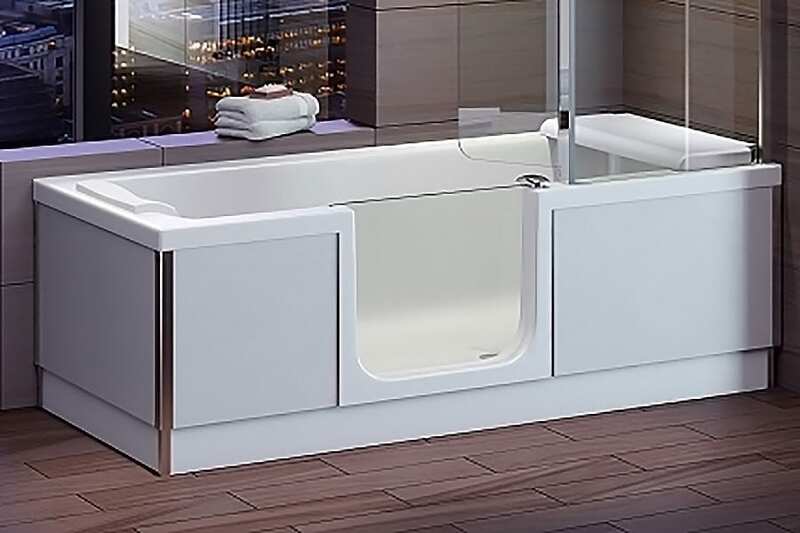 Simply step in through the wide easy-access opening, fill the bath to the desired height using thermostatically controlled taps for a controlled temperature and enjoy! We also offer walk-in bath/shower combos and height adjustable baths for maximum accessible ablutions. Our disabled bathroom design and installation service is available in Dorset and we have completed a number of disability bathrooms including a disability wet room, including a walk-in shower, for a customer with MS that boasts an excellent combination of functionality and flair. Listening to your needs – Our experienced bathroom design team are good listeners and are dedicated to fulfilling your exact needs. At the start of the process, we will work with you to understand your current and long-term needs for a disability bathroom or accessible washroom that can be used for years to come. Designing your space – For a disability bathroom design, our top priorities are practicality, safety and accommodating for your comfort and future needs. We will cater for the needs of everyone who will be using the facilities, able-bodied and disabled, considering everything from the accessibility and layout of the space to the positioning of the bathroom suite and range of movement required within. Selecting your bathroom products – When it comes to the type of bathtub, basin or toilet required, we will look at the size of your space, whether wheelchair access is required and the style and budget requirements for your project. We will talk through the options – such as raised basins, lever or infrared taps, push-button flushing, wash and dry toilets, hoists, support frames, power-shower settings, shower hose length and shower seats – and give you an idea of what everything will look like in place using Virtual Worlds, our specialist in-house CAD based bespoke design software. Selecting your bathroom tiles – Whether you are considering disabled wet room flooring or level flooring for a disability bathroom or washroom, your main concern is safety. You are going to want floor tiles that offer a slip-resistant surface under foot or wheel and create a level, visible surface (perhaps using contrasting colours, bold patterns or textures to distinguish different areas) for the easiest access. Important factors are also the water-resistance of the tiles used and their resistance to dirt and bacteria. The tiling experts of our sister company UK Tiles Direct will be able to advise you on the best possible floor and wall tiles for your disability bathroom. We may also be able to charge a reduce rate (5% VAT) for customers aged 60-years-old and above who require accessible bathrooms to suit their impaired mobility. Please get in touch to find out more about our bathrooms for the elderly and disabled and to see if your project will qualify for a VAT discount. We will transform your space to create an accessible bathroom providing independence for anyone suffering from a disability or physical limitations. With the possibility of saving up to 20% on your disabled bathroom project and the myriad disabled shower, accessible facilities and assisted living solutions available from Room H2o, now is a good time to book a free consultation with our bathroom designers and bathroom installation experts. Call us on 01929 551963 or email wareham@roomh2o.co.uk to get the ball rolling.